The positive member reviews on this site caught my eye. 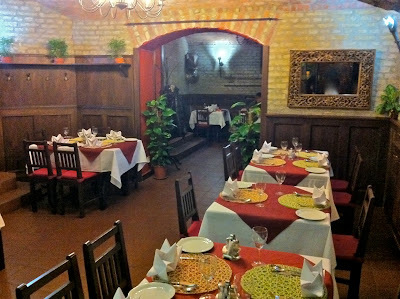 Lots of people said lots of nice things about The Pind (which means "The Village"), a new Indian restaurant in Vinohrady. I'm a skeptical optimist. I was both excited and doubtful. While I was wishing and wanting it to be good, it's hard to trust what you read on the Internet. Ironic, I know. So there's really only one way to find out. I had to go. For now, the restaurant's exterior is disconcerting. There was scaffolding, and it was pretty torn up underneath. Hopefully the work will be done soon. 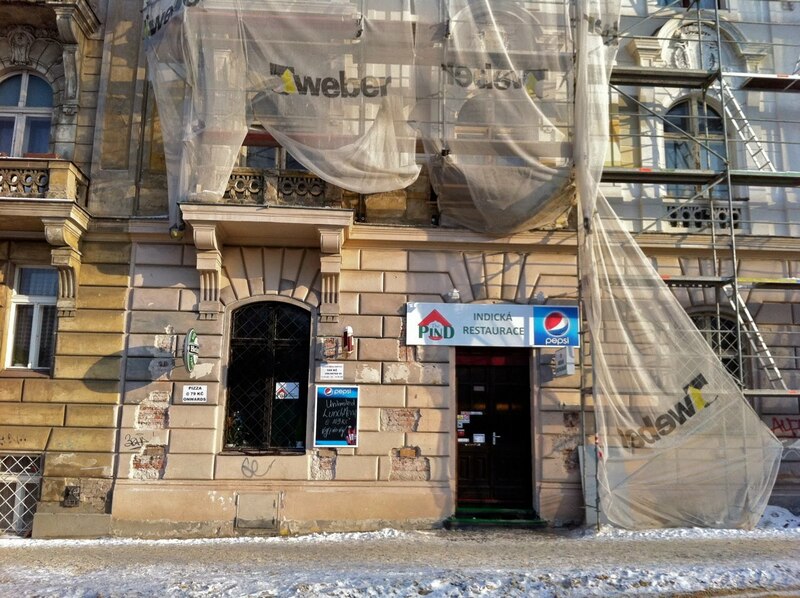 The restaurant is close to the Jiřího z Poděbrad metro stop, and also the Vinohradská vodárna stop for Trams 10 and 16. Anyway, it's what is inside that counts, and that is nicer. There's a small, upstairs space with benches. 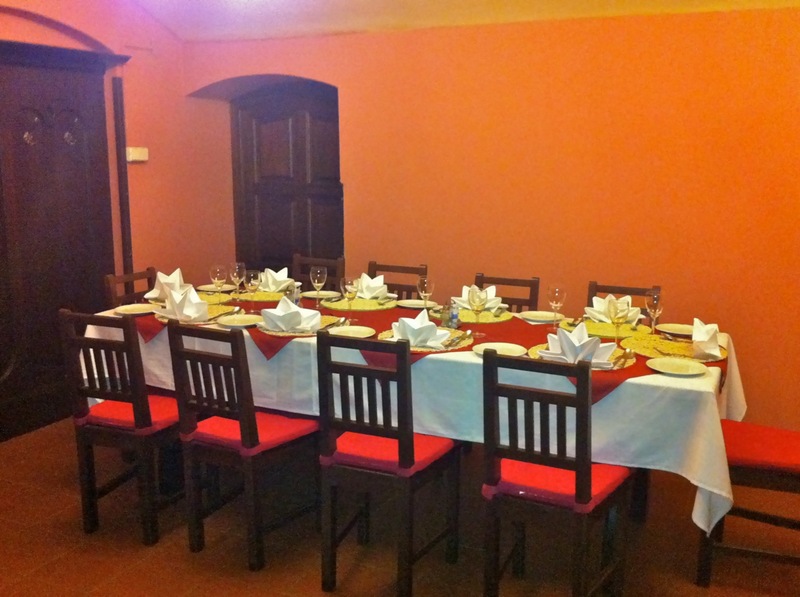 Here they serve lunches, an all-you-can-eat buffet, for a mere 109 CZK. It's also their smoking room. It looks much better downstairs. 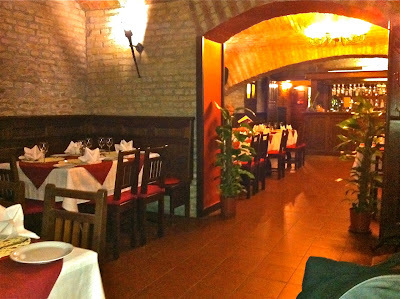 The restaurant is in the space once occupied by Vermeer. 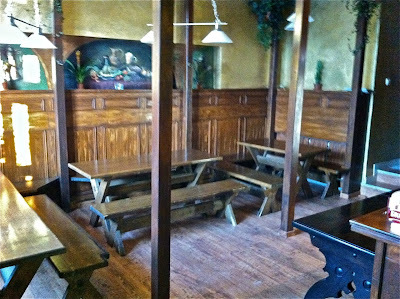 There are few changes to the interior, but I was happy to find they fixed the heating problems that plagued that restaurant. It was pleasantly warm. 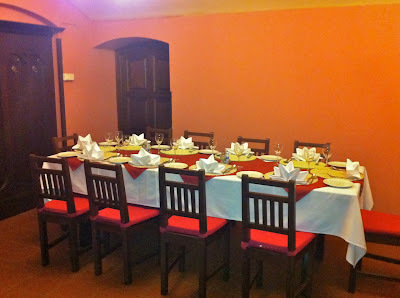 There are only about 10 tables downstairs, plus a separate room with a large table. 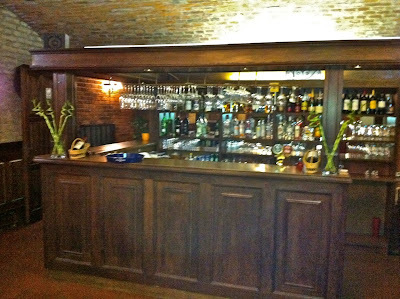 One of the three Indian men who own the place, Jayant, was standing behind the bar. He welcomed me and let me pick out a table. It wasn't very busy during my visits. I wanted to make some direct comparisons with Curry House, which many call the best Indian restaurant in Prague. So I ordered similar dishes to the ones I had there. My meal began with the vegetable samosas (55 CZK). 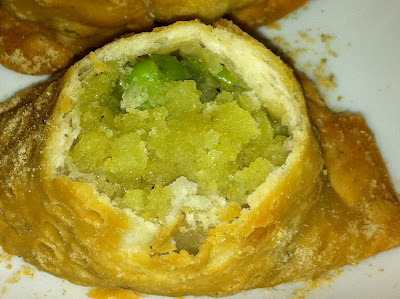 Filled mostly with potatoes and peas, this version had better seasoning than the blander ones at Curry House. They were crispy on the outside and almost too hot to pick up at first. 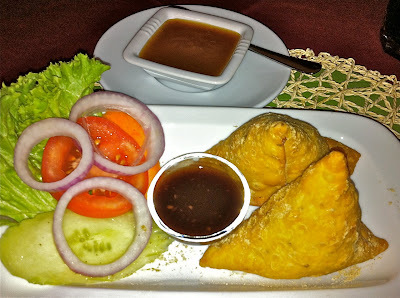 The samosas also came with a small dish of sweet, sour, spicy tamarind sauce. Great stuff. I got their mango chutney (20 CZK) to go with it. This was smoother than other versions I've had, with no chunks. But it had a lovely, aromatic taste. For a main course, I ordered the chicken tikka masala (165 CZK). 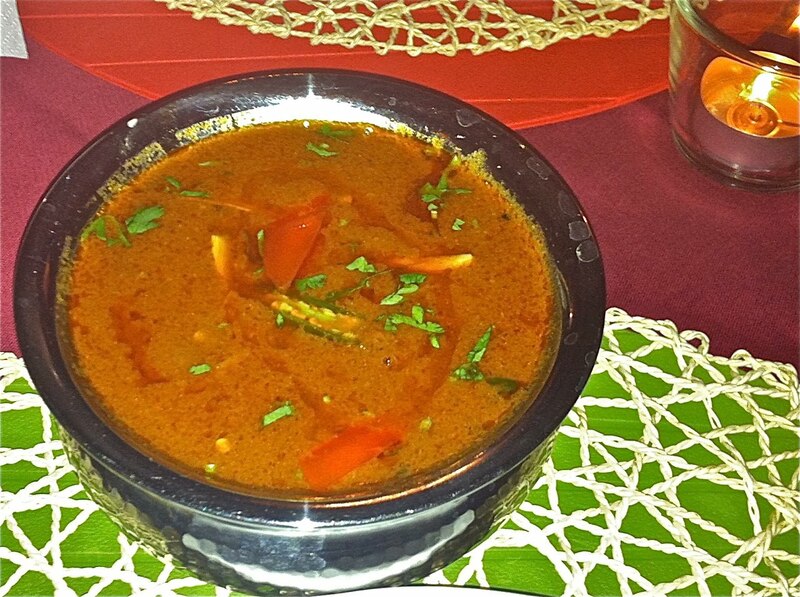 This one had a tomato-based sauce similar to that found at Masala. That's no accident since the chef, Sarkar, worked at that restaurant in Vinohrady. This dish was similar to what I had there three years ago. But I don't remember it being as good as The Pind's version. This one was amazing. First, the flavor of the chicken was just terrific. You could tell the spices hadn't just been slapped on the meat before cooking. It had marinated for a long time, with the seasoning penetrating deep into the meat. Second, it was tender. And third, it had a wonderful, smoky char from the tandoor oven. The sauce also sang with flavor, and the song was "Hot Stuff." It was full of fresh-grated ginger, coriander, capsicum, and more. The spice level was just at the edge of my limit. 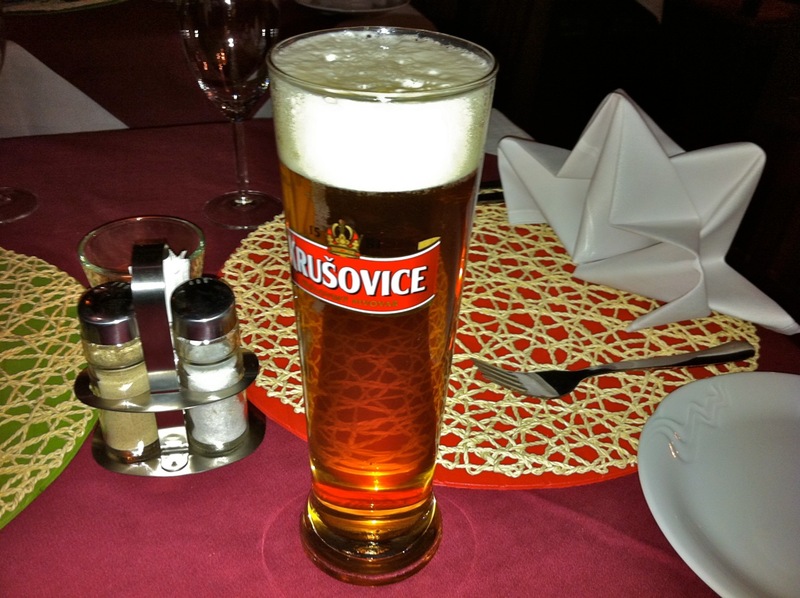 I told the waiter how much I liked it, but wondered it was too hot for Czech palates. He confessed that they engage in a little profiling. They make it milder when they know a customer is Czech. Some might be offended by this, others pleased. But you've been warned -- if you have a heat preference either way, let them know. This great dish was made even greater by the lemon rice (95 CZK). I'd never had this before, and almost didn't get it because of the high price. It was worth it. While not really lemony, the rice had its own light, smoked flavor to it. 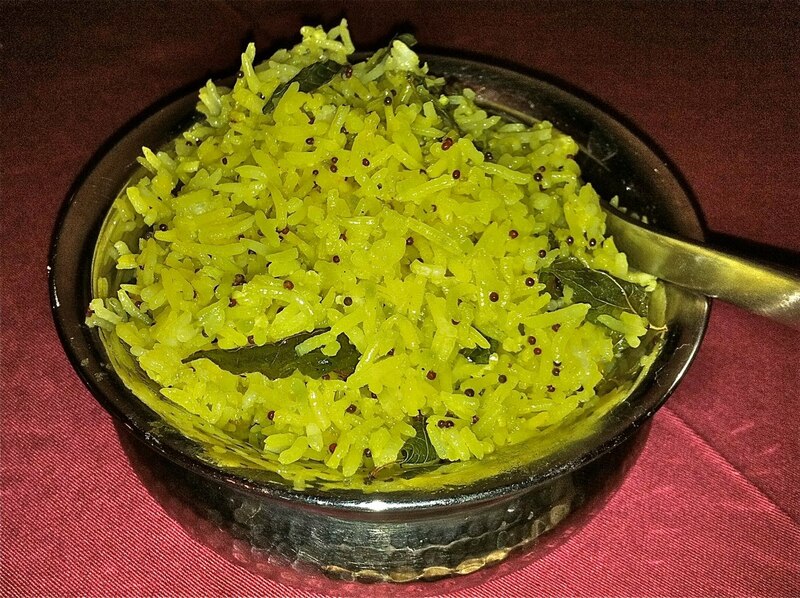 The fluffy grains were studded with mustard seed and mixed with dry curry leaves. Great. 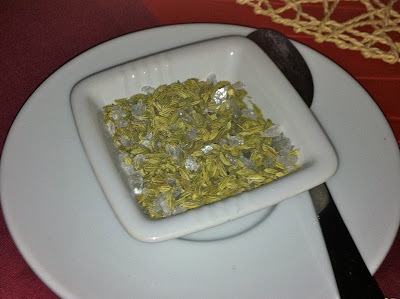 At the end of the meal, you receive a dish of licorice-flavored aniseed mixed with sugar to cleanse your palate. The bill for this visit, which included a Pepsi (35 CZK) because I had my car and a take away box (10 CZK) for leftovers, came to 380 CZK without tip. I thought it a bargain. I returned a few days later. On this solo visit, I started with the mushroom kurkure (75 CZK). The battered and fried mushroom caps were coated with a delicate, crispy, hot shell. They were filled with melted cheese, khoya (similar to ricotta), chat masala spice, and cilantro (coriander). The dish had a mild kick, which was tempered by an excellent little dish of mint sauce on the side. For my main course, I ordered another favorite, the lamb rogan josh (195 CZK). The six chunks of lamb, long-simmered in yogurt, were very tender. 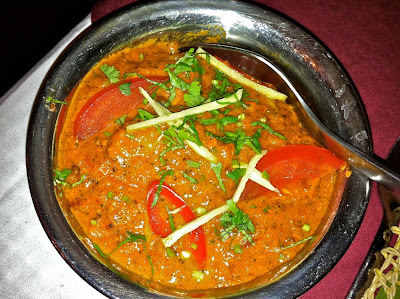 The sauce, flavored with coriander and ginger, was medium spicy. It was good, but I preferred the thicker sauced versions at Curry House and The Pind's close neighbor, Dilli-Delhi. The Pind's sauce was thinner and liquidy. 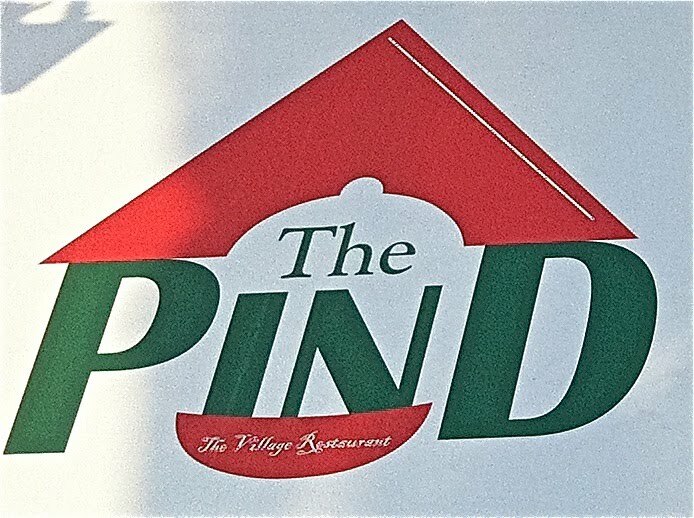 The Pind's website claims they cook according the authentic style of northern India and not the Westernized, commercial style found almost everywhere else. I am not expert enough to say if this is so. I wasn't in the mood for rice, so I got the butter nan (45 CZK). 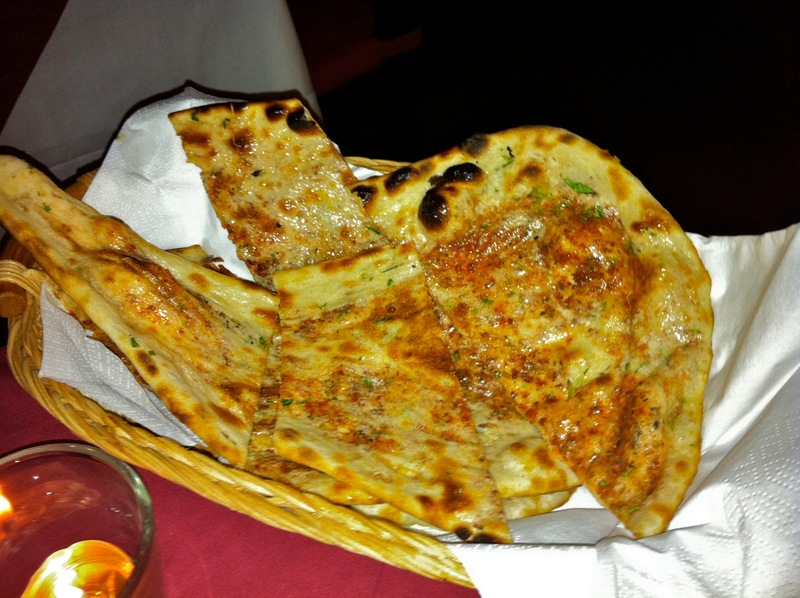 The thin, crisp, glistening bread had a light char and was good for soaking up the sauce with my lamb. This meal, with a bottle of Mattoni (35 CZK), came to 350 CZK without tip. On my third visit, I brought A Friend. I had a couple of glasses of Krušovice (40 CZK each). We started with the vegetable pakora (55 CZK). 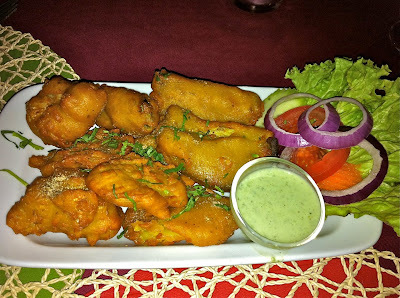 The variety of veggies had a cake-like coating of fried gram flour or ground chickpeas. Even though it was too salty for me and not served hot enough, I preferred the taste to the Curry House version. I ordered mango salsa and also raita (50 CZK) to go with it. 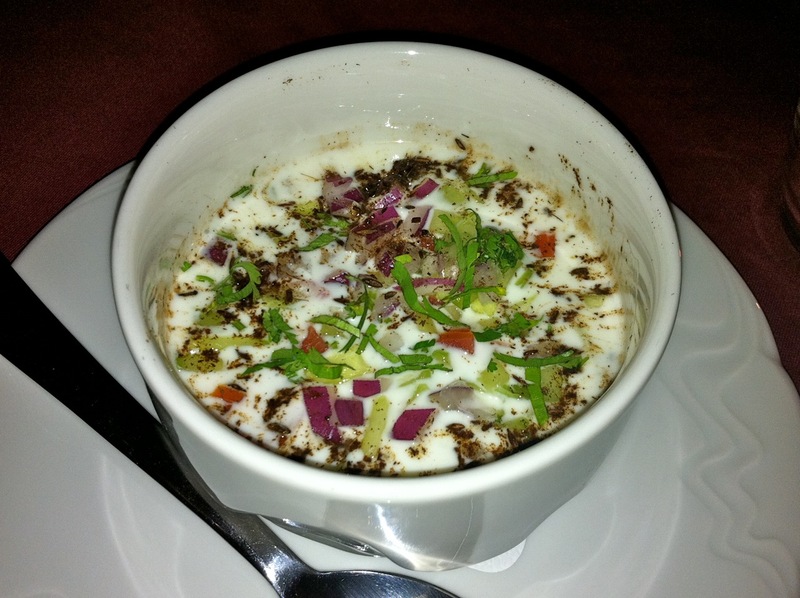 The thin yogurt of the raita was spiked with red onion, coriander, tomato, and other spices. It required some stirring to get the flavors to blend properly. For a main course, AF got the lamb biryani (210 CZK). I didn't realize it when we first ordered, but this also comes with raita on the side, so we had two. AF asked for it not to be spicy, but even so, there was a mild, building heat to it. 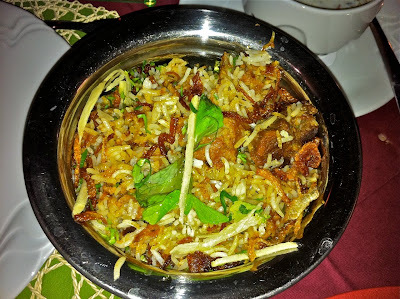 The lamb was tender and the pulao rice was good. It wasn't exactly bursting with flavor by itself, and the raita was a welcome addition. We shared an order of their lamb kulcha (60 CZK). The bread was thin and crispy, but I did not detect much lamb. I wanted to taste as many things as possible, so I ordered The Pind Platter (275 CZK). 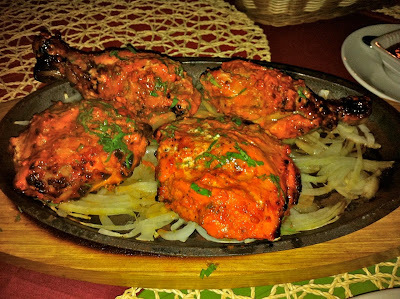 It came with fantastic achari chicken tikka. The boneless meat, was marinated in pickled spices and had tasty blackened edges. Next best was the fresh, light, boneless fish filet the waiter told me was sole. It was covered with a nice yellow curry. I was surprised I liked the fish so much. 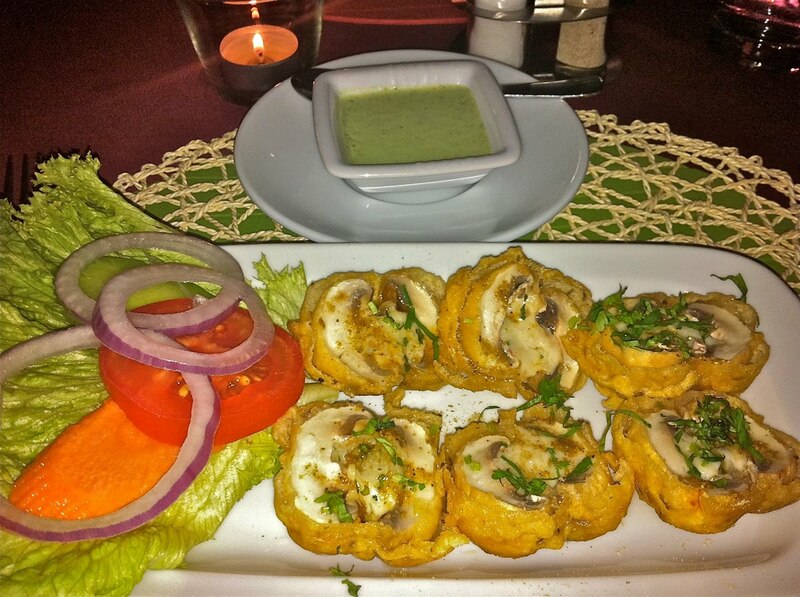 The chicken malai tikka was marinated with cheese and cream and grilled in the tandoor. For some reason, this was fairly bland. Finally, there was the lamb seekh kebab. The minced meat is mixed with ginger, garlic, and coriander. This was my least favorite. It had an odd, buttery aftertaste. 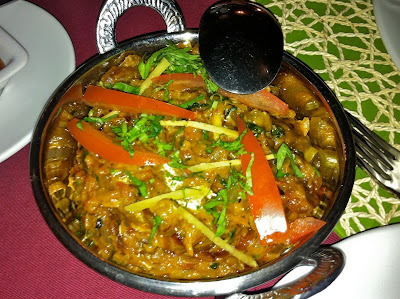 The Pind Platter was served on an iron plate covered with onions. I'd seen other tables receiving them sizzling from the kitchen. Mine had no sizzle and the onions were barely cooked. The meat wasn't hot enough. A disappointment there. Here's a quick rundown on, yes, my fourth visit, just before deadline. The deeply-fried onion bhaji 65 CZK) were dense and weighed upon me heavily. 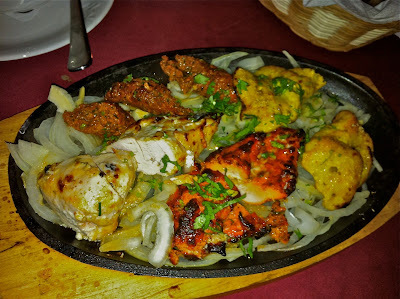 The tandoori murgh (175 CZK) was truly excellent, and it did, indeed, come out on properly hot iron with loudly sizzling onions. 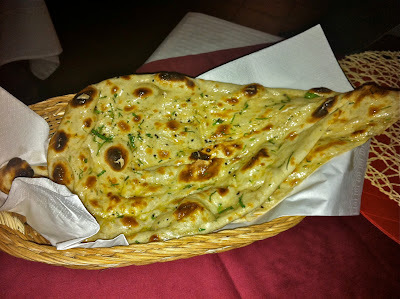 And I enjoyed the bangan bhara (165 CZK), made with creamy eggplant and tasting of coriander. My overall feeling about The Pind is very positive. Sure, there were a couple of dishes I didn't like or weren't heated properly. But I'd say anything from their tandoor is the best I've had in Prague. In fact, I'm still dreaming of that chicken tikka masala. It is the most extraordinary I've found while making my rounds. Right...have to try that one. There's nothing better than a good curry! Since I can't resist a nice indian rest review, i had to give this a try. I was pretty dissapointed though especially in the light of your comments. The tikka masala was no way near what i remembered from masala, if i were to say, it's more like the current version in masala (which has deteriorated a lot). Maybe that chef wasn't cooking that evening. 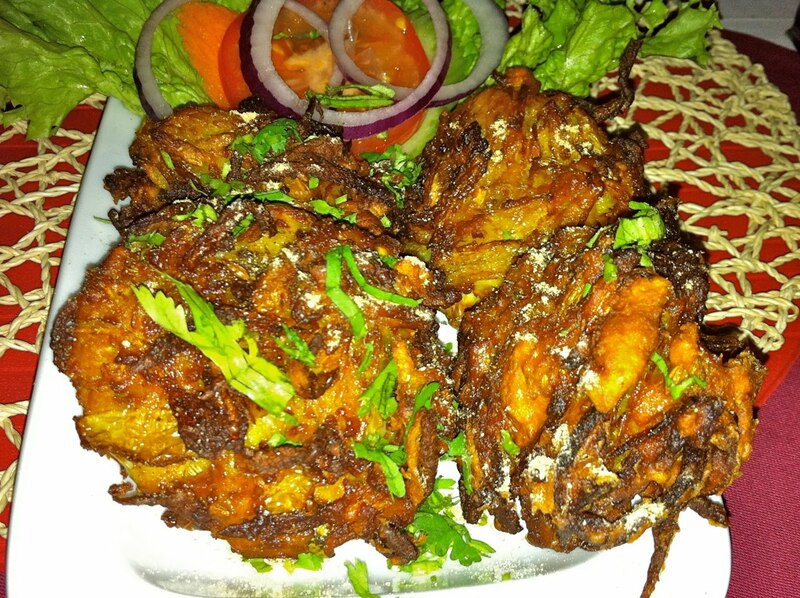 We also tried the Chicken Chettinaad - basically chicken bits soaked in fried onions, almost no flavor. It's a pitty for indian restaurants especially that the dishes are not consistent and depend on who's cooking. I've had the best tikka masala at curry house, but it's a hit and miss depending on who's cooking. This is still Prague's best Indian, but the creator of the Pind, Jayant Sarkar seems to have left the business, to create a new up market bespoke catering service. Might some one have the details of this new operation and be so kind to post them here or mail me.